Installing SIM card in iPhone is basic requirement to get going with usage of iPhone. Newer iPhone 4 has different routine to insert and install SIM card as against previous iPhone 3GS. Following is visual guide for installing SIM card in iPhone device you own. 1. Checkout right side of iPhone 4 device. 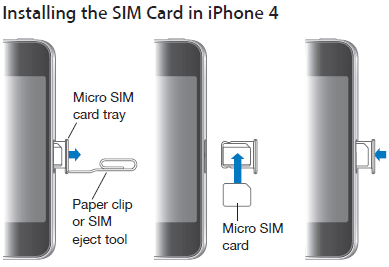 Insert the end of paper click or use SIM eject tool into the hole on the SIM card tray. 2. Push the paper clip firmly till tray pops out. 3. Pull out SIM tray and place SIM card in it. Then insert back the tray containing the SIM card. 1. Insert paper clip or SIM eject tool at the top of iPhone 3GS device. 2. Push the paper clip to bring out the try. Then pull out SIM tray. 3. Place SIM in the try and insert back SIM tray with the SIM.